Howell-Oregon Electric Cooperative is committed to educating students on subjects including electrical safety, energy efficiency and leadership. 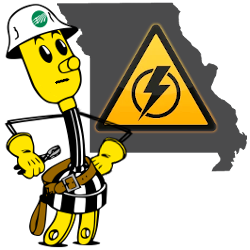 HOEC works with its transmission cooperative, Sho-Me Power Electric Cooperative, to provide educational programs each year in schools in the HOEC service area, which includes 18 public schools and numerous private schools. Pictured at left, Sho-Me Power's Eddie Goins works with Junior High School and High School students in Vocational Agricultural classes and Science classes. His program's content includes the topics of energy efficiency and electrical safety. Sho-Me Power's Becky McGoon, at right, conducts the elementary school programs for the 3rd through 5th grade classes. Her programs consist of electrical safety and how electricity works. Howell-Oregon Electric Cooperative also visits preschools to teach the area's littlest students about electrical safety and citizenship. At left, Crew Foreman Dale Holden is pictured with students from Shannon County. If you work with a school in HOEC's service area and would like to learn more about scheduling a program at your school, contact the Member Services department at 417-256-2131 or toll-free at 1-888-HOE-POWER.